How Can I Properly Swaddle My Baby? To properly swaddle your baby follow the steps below. Place a light cotton blanket on your bed (use a 44-inch by 44-inch square) and orient it like a diamond, with a point at the top. Fold the top corner down. The top point should end up near the center of the blanket. Place your baby on the blanket, her neck right above the edge. Holding the right arm against her side, grab the blanket about four inches from her right shoulder. Then, pull it snugly down and across her body. Tuck it under the left buttock. (It will look like half of a V-neck sweater.) Next grab the free blanket, beside her left shoulder. Tug it firmly - away from her body - to remove any slack. Note: Don't be surprised if your baby's cries escalate when you start to swaddle. Your not hurting her. Now, holding her left arm against her side, bring the point at the bottom of the blanket straight up and place it on her left shoulder. Tuck the blanket edge snugly around the left arm. Again, grab the blanket next to her shoulder and pull it straight out – away from her body – to remove any slack. Note: The blanket should be loose around her legs, but her arms should be very snug and straight. Bent arms let babies wiggle out… and that makes them cry even more. Grab the blanket just a few inches from the left shoulder and pull it down. - just a smidge. The small flap should come down to her upper chest to form the other half of the V-neck. Lightly press that smidge against her breastbone, like you're holding down a ribbon while making a bow. Note: Don't bring this fold all the way down to your baby's feet. It's just brought down to the chest. Note: This last step is not straight up… it is really up and across. The arms will be held snug and straight, but the legs should be loose enough to bend at the knee and open at the hips. 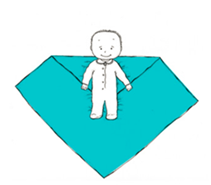 If you’re confused at all, watch the three swaddling demonstrations on The happiest baby DVD or take a lesson from a happiest baby educator (www.happiesbaby.com). And if you’re still struggling, there are many Velcro or zipped pre-made swaddles on the market.